Responsive Home Care is dedicated to providing high quality, dependable home care services in Davie, FL. Services are customized for each client and cover a vast array of in-home care options to fit every schedule and need, including hourly home care aides, respite care and specialized Alzheimer’s and dementia care. Responsive Home Care’s highly qualified and carefully screened caregivers provide professional care in private residences, assisted or independent living facilities, nursing homes, hospitals or rehabilitation centers. Partnering with Responsive Home Care for your senior home care needs ensures that you’re working with the best of the best. We’ve been in similar situations ourselves, requiring care for our own loved ones at home, and know how difficult it is to decide upon the best way to provide that care. We’ve been living and working alongside you in the Davie area for years, and we adhere to the most stringent requirements for our caregiving team – allowing families to have the peace of mind and security in knowing they’ve made the right decision for their senior loved ones, who will benefit through enhanced socialization, quality of life, and overall wellbeing. When a caregiver enters a senior’s home for the first time, it can cause some anxiety and feelings of uncertainty. 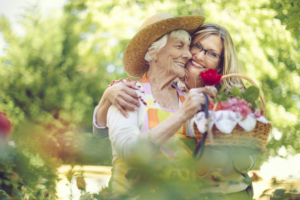 However, when that caregiver is a Responsive Home Care caregiver, those feelings of trepidation quickly melt away as a bond develops and trust is established. We help foster this process by carefully screening, background checking, interviewing, and training each caregiver who comes into the Responsive Home Care family, ensuring they’re adept in a variety of aspects of aging care, including fall prevention, dementia care, chronic disease care, preparing meals, and more. We also consider personality traits, likes and dislikes when matching a caregiver to a senior, allowing for additional comfort and ease in building the relationship. We would love to talk with you one-on-one to answer any questions you may have about our Davie home care services and to provide you with some additional resources that will be helpful in your particular situation. Simply contact us online or call us at 954-486-6440 any time.